You are here: Home » Chevelle Build » At Long Last: The Chevelle Makes the Cover of Super Chevy Magazine! Cover Girl? You bet! 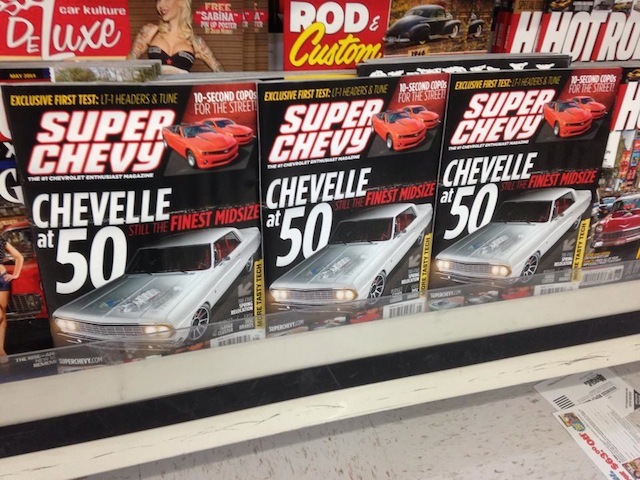 My Chevelle is the cover car for the May 2014 Issue of Super Chevy Magazine. Get your copy today! If you’ve been following the Chevelle Build for any amount of time you know full well that it was a labor of love, and kicked off by the amazing gift Jeff Allison (Allison Customs), a podcast listener from New Mexico whom I’d never met in person, gave me in March of 2011. His offer? To fully restore and build my old Chevelle from a good 20-foot car full of hidden problems into the the race car of my dreams (check out Podcast #72 to and my blog post “The Chevelle Build Begins” to get the full scoop). There would be no charge for the labor at all – I’d only be responsible for the parts. Jeff’s gift turned out to be far bigger than either of us likely guessed it would, and I can’t give him enough credit for honoring his word and commitment (even when the project was not so much fun for either of us). What started out as a mild restoration turned into a full blown custom car creation. There isn’t a nook, cranny, corner, or panel that Jeff didn’t fabricate, design, or repair. Not one. From the top of the roll cage to the custom made coil over mounts on the rear end he did it all and everything in between. We had no idea when we started the project together the number of other people and miracles that would be involved, but one of the biggest came from Zip Simons and Don Endonino, owners of Street Metal Concepts in Orlando, FL, would offer to take on all final metal work, body, and paint, completing the entire car in 50 straight 16-20 hour days….and doing so on the meager budget that I could afford (check out Podcast #183 to hear more about them). Chevelle sponsors! This custom set of vinyl was designed by my pal Kirk Hansen at National Parts Depot. He not only handled everything for the Chevelle for me personally, but he also did all of the artwork for the car and shirts! 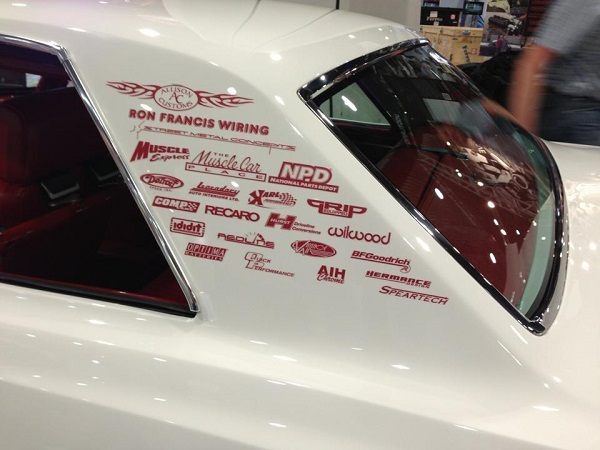 I’ll close this post out with a reference of all of the sponsor contributors to the car (see the picture on the right). Everyone of them helped and was crucial in getting the car out and done, but none quite as big as my wife and father. My wife has allowed this entire business venture to happen, all while juggling raising three young kids, homeschooling one, and teaching classes at the same time. My dad has been a big supporter as well, personally and financially, and I think he’s just as excited to take a ride in the Chevelle again as I am! Jeff – thank you AGAIN for being my friend, and for building my dream machine! This blog sponsored by our pals at National Parts Depot – your premier source for muscle car restoration parts! I’ll include a cool video they commissioned at the SEMA show last year covering the car. They are an unbelievable company to work with – and special thanks to my pal Kirk Hansen there for making everything happen!